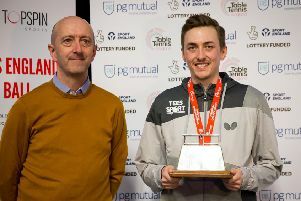 Liam Pitchford notched one of the biggest wins in English table tennis history by knocking world and Olympic champion Ma Long out of the Bulgaria Open in the last 32 today. The Chesterfield player, a London and Rio Olympian and England’s most decorated Commonwealth table tennis athlete, beat his Chinese opponent 4-3 (7-11, 9-11, 14-12, 13-11, 7-11, 13-11, 11-6). It is revenge for defeat to Ma Long in the team quarter-final at the Rio 2016 Olympics, when Pitchford troubled his opponent but lost 3-1. Pitchford, currently ranked No 48 in the world, faces another Chinese athlete, Ma Te, in the last 16 on Friday, when he and partner Paul Drinkhall, the Commonwealth Games gold medallists, are also due to meet Koki Niwa & Jin Ueda of Japan in the doubles quarter-finals. Drinkhall was beaten 4-1 by top seed Dimitrij Ovtcharov of Germany in his last-32 singles tie today.